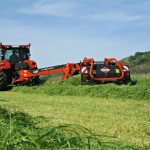 KUHN Farm Machinery will be displaying a wide selection of hay and silage making equipment at this year’s Grassland and Muck event, with key machines at the show on 24th and 25th May including the FC 3160 TCD RA centre-pivot trailed mower conditioner with grouper functionality, the GA 13131 four rotor grass rake, and the GMD range of disc mowers. 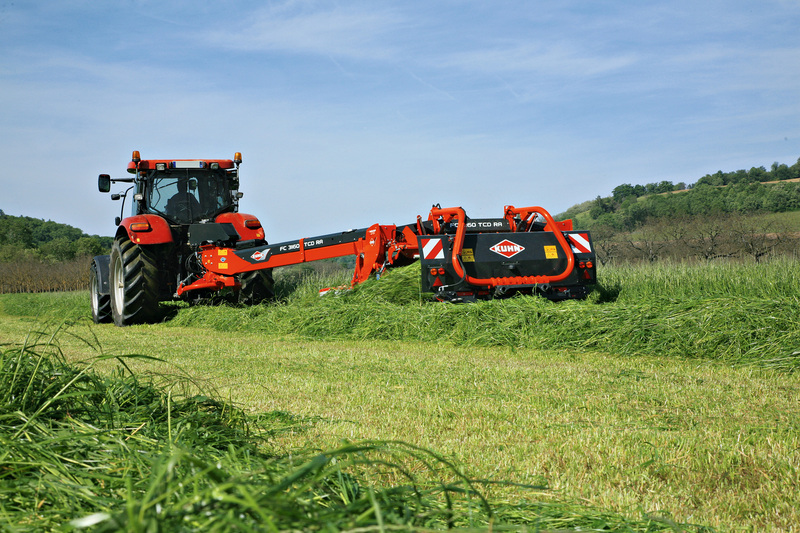 Ideally suited to large-scale farming operations and grassland contractors, the FC 3160 TCD RA offers all the key advantages associated with KUHN’s standard centre pivot mower conditioner (the FC 3160 TCD), such as greater mowing versatility and reduced ‘dead time’ on headlands, as well as having the ability to group two swathes of grass together. The FC 3160 TCD RA uses a conveyor belt grouper unit that enables two rows of grass to be placed together to form a twin swath for increased output of the subsequent forage harvester. The conveyor also enables two rows of grass to be formed into a single, layered swath that can be picked up by balers or loader wagons with a narrower pick-up width. 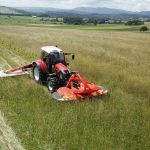 The addition of a belt conveyor saves time and fuel by reducing the number of subsequent passes needed with a grass rake or forage harvester. It also reduces leaf losses and prevents soil or foreign materials being incorporated into the swath during raking. The hydraulically driven grouper belt is powered by a pump mounted on the machine’s GYRODINE swivelling headstock and can deliver the cut and conditioned crop to either side of the machine. The speed of the conveyor belt can be instantly increased or decreased to take into account the amount of crop being cut or to alter the width of the finished swath when working on sloping terrain. The FC 3160 TCD RA uses seven cutting discs (each fitted with KUHN’s FAST-FIT knives as standard) giving it a 3.1 metre working width and a 2.99 metre travelling width. The speed of the steel finger conditioning flails can be set at either 780 or 1,000 rpm according to the crop being worked. All functions – such as belt speed, direction of delivery and lifting options – can be adjusted from the comfort of the tractor cab via a central control box. The FC 3160 TCD RA is also fitted with wide profile, low-pressure tyres for reduced soil compaction and improved performance on sloping ground. The GA 13131 Gyrorake has a working width of 8.4 to 12.50 metres and is designed for use on farms where a high work output is required. 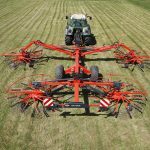 The machine features four rotors, the front hold 11 tine arms and the rear hold 12 per rotor, each with four tines per arm. Each rotor is mounted on four pivoting, large diameter wheels for excellent ground contouring and high load bearing. 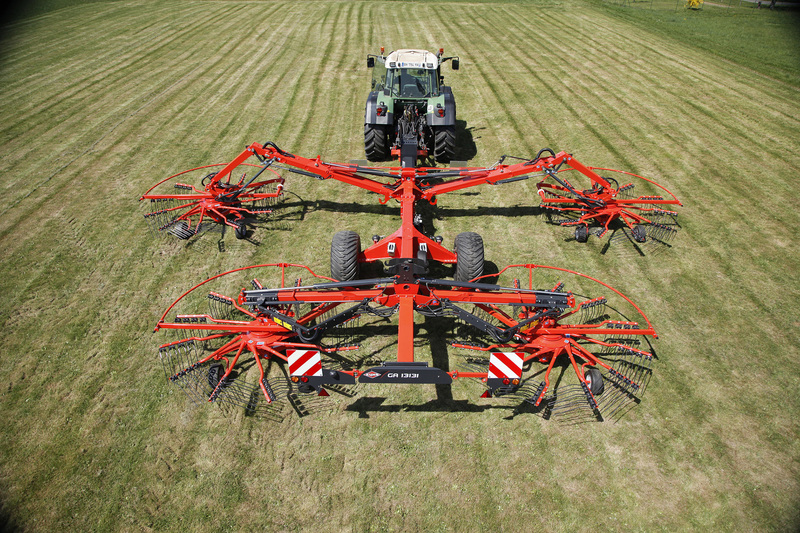 The wheels sit close to the tines to further improve ground following, while Kuhn’s three-dimensional rotor suspension system provides even greater stability when working at high speeds. The four rotors work together to create one perfectly formed central windrow (from 140 to 240 cm in width) and are controlled via a cab-mounted VT50 series terminal which is ISOBUS compatible and which allows operating sequences to be pre-programmed for easy u-turns. Each rotor can be lifted individually for a perfect finish and to give the machine higher ground clearance for ease of manoeuvring and unhindered travel across uneven terrain. The GA 13131 is characteristically robust and utilises Kuhn’s Masterdrive GIII gearbox to reduce power transfer stresses and provide reliable service with low maintenance: the Masterdrive’s patented two-stage design uses bevel and spur gear reduction and is totally enclosed for minimal maintenance – service intervals are every 200 hours. The GA 13131 requires a minimum PTO power output of 95hp. When in transport position, it stands at less than 4 metres in height, folding to 3 metres in width, making roadwork easy and safe. 2017 marks the 50th anniversary since the first Kuhn GMD disc mower was launched. Kuhn will be commemorating this by displaying an original GMD 4 at Grassland and Muck. The model to be displayed was built in 1969 and was in constant use until 12 months ago when it was finally retired. The machine has recently been acquired by Kuhn in France and is destined to become a key feature of the company’s museum collection. 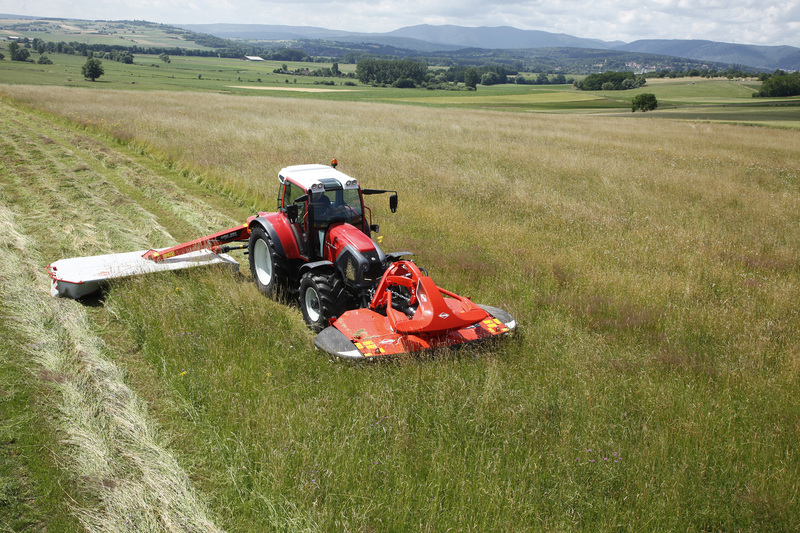 The latest generation of GMD machines (available in working widths ranging from 2.6 to 5.2 metres) offers many of the same benefits as the original machine: an entry-level, affordable and efficient machine which can produce the highest quality forage, with added features including Kuhn’s LIFT-CONTROL and PROTECTADRIVE systems. The LIFT-CONTROL suspension and non-stop safety system ensures excellent ground contouring along with a 31-degree range of travel which maintains a consistent mowing height, even at high forward operating speeds. It also ensures the machine’s mechanical components are protected against impacts whilst operating on uneven ground by reducing ground pressure and allowing the mower to pivot away from obstacles by up to 25 degrees while also lifting clear of obstructions. The PROTECTADRIVE safety system adds a further element of safety by protecting the OPTIDISC cutter bar’s internal components, which include Kuhn’s FAST-FIT knives, from impact damage. In the event of a violent impact between a disc and an obstacle, the shaft holding the disc will shear just above the bearing, thanks to a carefully dimensioned shear groove, thereby protecting the disc’s moving parts. The shaft can subsequently be replaced in less than 15 minutes, reducing downtime and expensive repair bills. The GMD is also available in an RS version which delivers the forage into a narrow swath to avoid running over cut grass.